George Galloway said he was 'angry' after the case. MP George Galloway has won £150,000 in libel damages from the Daily Telegraph over claims he received money from Saddam Hussein's regime in Iraq. The Glasgow Kelvin MP had denied ever seeking or receiving money from Saddam Hussein's government, which he said he had long opposed. The newspaper said it was in the public interest to publish the claims, based on documents found in Baghdad. It later emerged Mr Galloway will stand in Bethnal Green at the next election. Mr Galloway, who was expelled from Labour for comments about the Iraq war, will contest the seat for the Respect coalition against sitting Labour MP Oona King. Mr Justice Eady said he was "obliged to compensate Mr Galloway... and to make an award for the purposes of restoring his reputation". Outside the court, Mr Galloway said: "I had to risk absolute and utter ruin to bring this case. "If I had lost I would have been homeless, I would have had everything I possess taken from me and would have been bankrupted and forced out of public office. "In those circumstances I don't feel in any way happy about the award of £150,000. "I feel angry that I have been effectively banished from the floor of the House of Commons for more than a year, I have had to risk everything to bring this action. "I feel angry against [former telegraph owner] Conrad Black, [former editor] Charles Moore and [Lord Black's wife] Barbara Amiel." A Telegraph spokesman said the judgment was "a blow to the principle of freedom of expression in this country". The newspaper was refused permission to appeal although it can apply to the Court of Appeal direct to take the case further. Following publication in April 2003, an investigation was begun by the Parliamentary Commissioner for Standards. Neil Darbyshire, the newspaper's executive editor, said questions arising from the Iraqi documents still needed to be answered by the commissioner. "It has never been the Telegraph's case to suggest that the allegations contained in these documents are true," he said outside court on Thursday. "These documents were published by us because their contents raised some very serious questions at a crucial stage in the war against Iraq. "The Telegraph did not and could not perform a detailed investigation into their contents." He added: "When we published the documents we did so believing that their contents were important, should be made public and would in due course be investigated by the proper authorities." Mr Justice Eady imposed a "stay" on damages and costs pending the outcome of any such application, which is likely to be in the New Year. Mr Galloway said costs amounted to £1.25m. The judge said the allegations were "seriously defamatory" of Mr Galloway. 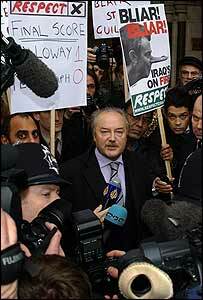 Mr Galloway had been in Saddam's pay, secretly receiving about £375,000 a year. 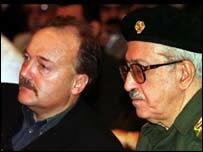 He diverted monies from the oil-for-food programme, thus depriving the Iraqi people of food and medicines. He probably used the Mariam Appeal, a campaign Mr Galloway launched to raise money for an Iraqi girl with leukaemia, as a front for personal enrichment. What he had done was tantamount to treason. Mr Justice Eady said: "It was the defendants' primary case that their coverage was no more than 'neutral reportage' of documents discovered by a reporter in the badly-damaged foreign ministry in Baghdad, but the nature, content and tone of their coverage cannot be so described." Telegraph foreign correspondent David Blair had earlier told the judge how he had found the documents inside the Iraqi foreign ministry. The judge said that although Mr Galloway was interviewed by telephone on 21 April, he was not given an opportunity to read the Iraqi documents beforehand, and neither were they read to him. The reporter who contacted him, Andrew Sparrow, only summarised the claims relating to funding of the Mariam Appeal, but did not tell him the newspaper was planning to publish claims about personal enrichment, the judge said. "[Mr Galloway] did not therefore have a fair or reasonable opportunity to make inquiries or meaningful comment upon them before they were published."